We started the day at the mission in Santa Barbara which was founded in 1786. Mrs McNay – who is our partner in crime at BD – showed us around. There are 21 missions in California, the reason for that is that people who travelled back in the days by horse, let’s say, could reach a mission within a day and had a place to stay and be safe. The mission is the only mission under the continuous control of the Franciscans since its founding. It was a place for Indigenous people who were overseen by a couple of friars. The present church is the fourth to stand on the Seite. the facade and some of the interior detailing were patterned after an ancient Roman temple. The grounds are really beautiful, there is a huge garden, a cemetery, a very old fig tree and you can see the Indigenous‘ influence in the architecture and also in the craftsmanship. We also learned about Juana Maria, an Indian woman who was abandoned on San Nicolas Island for 18 years and was found and brought to the mission where she also died. There is a whole story dedicated to this woman and her adventure which school kids read in Santa Barbara and it goes by the name: Island of the Blue Dolphins by Scott O’Dell. After this cultural experience we couldn’t wait to go back to school to say our Goodbyes and to be an American student for one last time. 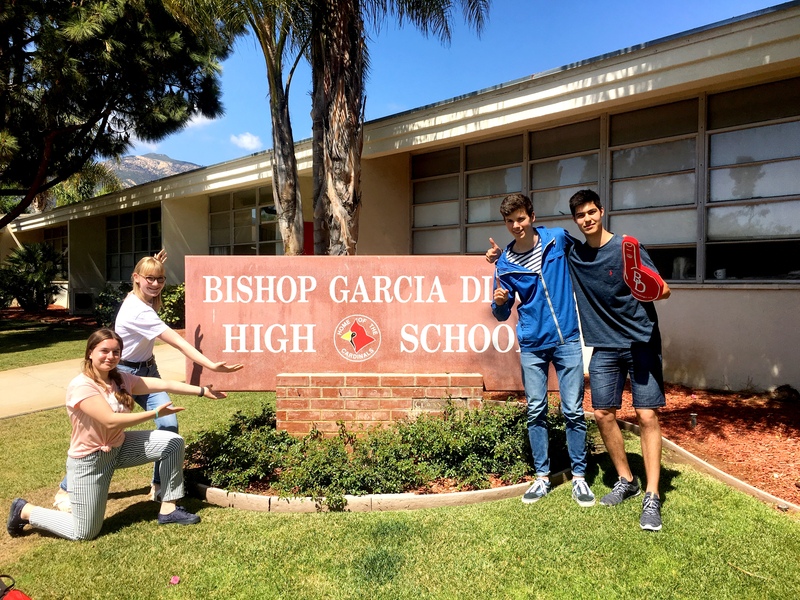 We enjoyed every second of it but eventually school finished and we went to see Mrs McNay who prepared the nicest gifts for us- we are now fully covered in Bishop Diego gear – from foam fingers to T-shirts, we got it all and couldn’t be more grateful! We were told, that we are now part of the Bishop Diego family and that we are welcome any time. The strange thing is that we actually feel that way, as if we are a part of them. It’s due to the new friends we made at school- be it the students or the teachers and everybody who is part of the school board that made this experience so special to us and actually who made it even possible that we could visit – even if it was just for a week, we are the happiest kids around and just so lucky that we can call Santa Barbara and Bishop Diego High School our home! Thank you so much! We took a few last pictures and left. We decided to do one last fun thing by going back to downtown and check out the old court building. We climbed up the stairs of the bell tower and had a 360 degree view over Santa Barbara. From up above it didn’t seem to be that big. Well, it actually isn’t that big. Only 90.000 people live there (Pink, Katy Perry, Jeff Bridges among others) and so we could discover places we’ve already visited which was fun. Also the architecture is really special and influenced by Hispanics. People get married here and it is still a running court trapped into this beautiful old body with intricate designs and iron lanterns for example. Anyhow, afterwards some of us did some souvenirs shopping while others made a stroll to the beach. We actually wanted to go out for dinner but were convinced by the girls to not throw away any food, so we cooked and had some leftovers while the boys watched a basketball game. Last thing on the agenda was packing, which we did. Tomorrow was the day of our departure which we wanted to begin with a breakfast at ihop (international house of pancake).